The Daily News also reported this story. In one of its stories, it claims that "...Ian Caine, [the officer], then stepped back, pulled out his gun and opened fire..." in front of Dunkin' Donuts. It also has a big picture of Dunkin' Donuts on it. The Daily News' other article clearly shows that Kadeem Trotter's body and his bike, was found by the police across the street, in front of the MTA depot, where at least three cameras are mounted upon this building. The picture also shows two shell casings marked by a tree, diagonal to an SUV with at least one bullet hole in it. This, along with other evidence obtained by the family of the condition of his body, conflicts with Caine's account of the story. The family now knows for certain that Kadeem was shot in the back, twice and the right buttocks, not in the chest as other media has reported, not in front of Dunkin' Donuts and apparently, not facing this officer, but fleeing. The medical examiner has also ruled Kadeem Trotter's death a homicide. However, Kadeem's mother and the rest of the family have been denied access to the M.E. 's report, the police report and the police department claims that it can't find the voucher so the family can have his belongings returned. The family has retained an attorney and filed two notices of claims upon the state and the city of New York. The family awaits the ADA's release of the footage from the MTA. Read the link below to find out the true story about what happened to Kadeem Trotter. On Sunday, September 18, 2016, 24 year-old Kadeem Trotter was fatally shot by off-duty court officer Ian Caine. Shortly after his death, conflicting reports surfaced on local television news and across the internet. One report claimed claimed that Trotter, armed, was killed by an off-duty police officer in a thwarted robbery attempt outside a Dunkin’ Donuts. Other reports inidcated that Trotter was armed with a BB gun and was shot in the chest while allegedly, attempting to rob Ian Caine of his holstered handgun. 49 year-old Ian Caine, the shooter, was moonlighting as a uniformed security guard for Allied Security. Trotter’s family wasn’t officially notified until days after published reports and were told a sharply different story. A day later, more details surfaced that contradict Ian Caine’s account of the incident. While the Daily News initially reported that Caine ‘opened fire’ in front of Dunkin’ Donuts, Photos from later reports clearly depict Kadeem Trotter’s bike at the site where his body was found by police, in front of the MTA depot, roughly 200 yards away from the Dunkin’ Donuts restaurant location. The Queens Medical Examiner ruled Trotter’s death a homicide, but was restricted from issuing an official report by the Queens DA. This prompted the Trotter family to obtain the Queens Hospital Emergency Room Report which revealed, Kadeem was inflicted with three entry wounds, two in the back, one in the buttocks. 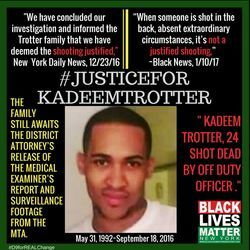 Despite multiple requests, the Trotter family has so far been denied access to pertinent reports and other items including a physical copy of the Medical Examiner’s report, the official police report, and surveillance footage from cameras at the MTA depot (where Kadeem’s body was actually found). The police department has not produced evidence of the aforementioned BB gun and also claims to have lost the voucher permitting the family to retrieve Kadeem’s belongings. Queens DA Richard Brown announced on Thursday, December 22, 2016 that the court officer was justified in his use of deadly force. Officer Ian Caine, 50, will not face any charges in the September shooting death of Kadeem Trotter. The Trotter family’s attorney, Edward Sivin, has filed a $10 million Notice of Claim upon the State and the City of New York on behalf of the Trotter family. “When someone is shot in the back, absent extraordinary circumstances, it’s not a justified shooting,” said Silvin. The family still awaits the district attorney’s release of the Medical Examiner’s Report and surveillance footage from the MTA.